Description: 1) Widely used for tactile paving slab in guiding paving; Bathroom floor paving; Wall decoration; garden, park, yard trail. 2) Color: Black, Grey, Pink, Red, and Yellow. 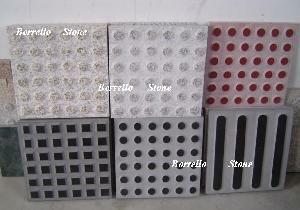 3) Material: granite, marble, sandstone. 4) Price Terms: FOB Qingdao, CIF.